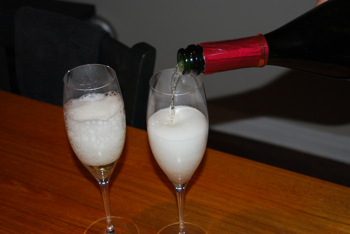 Sparkling wines are wines which have effervescence, bubbles. While the most famous of all these fizzy wines is Champagne which comes from the French region of the same name, bubbly wine is made all over the globe in various styles and from various grapes. In fact, most regions produce at least one example of bubbly wine. Bubbly wine is bottled in special bottles with thicker glass and special corks, usually with a wire cage over them, to hold in the high gas pressure inside. These wines, like a beer or soda, release their gas when opened, resulting in a bubbly wine whose taste is accented by the pleasant prickle of the bubbles. Besides Champagne, some other commonly found sparkling wines include Spanish Cava, Italian Prosecco, Californian Sparkling examples, Moscato d'Asti and others. They vary in style depending on the type and also vary in terms of the amount of effervescence (the pressure). Some are just lightly sparkling while others, like Champagne, are fully bubbly. While most are white wines, some are Rosé and there are even examples of sparkling red wines such as Lambrusco! 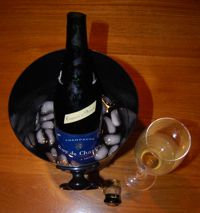 Although only wines made in Champagne can be called Champagne, other wines from around the world made in a similar style are often labeled Méthod Traditionelle or Traditional Method or Méthod Champenoise. The traditional Champagne method for making wines sparkling (the Méthod Champenoise) is a complex process. Carbon dioxide gas is a natural product of alcoholic fermentation that all wines undergo. However, those bubbles of gas are lost to the air as the wine ferments in open top fermenters. So a second step is needed to get those bubbles into your bottle. First of all, a normal still wine (no bubbles) is produced (in Champagne known as the vin clair). This base wine is then usually aged in oak for some period of time. After aging the wine is then bottled. However, into the wine at the time of bottling is added a mixture of sugar and yeast. The bottle is tightly closed, usually with a crown cap (like those found on soda and beer bottles). It is then left to age again. This time, as the yeast gets busy it devours the added sugar, converting it to more alcohol. However, in the process those great little yeasties make carbon dioxide as a byproduct of the alcoholic fermentation. But because the bottle is closed tightly, the gas cannot escape! This results in the gas getting dissolved in the wine, creating bubbles. While this procedure now results in a sparkling wine, there is a problem. You still have a cake of yeast sitting in the bottle! While this is fine to drink, it would be cloudy if poured straight into glasses. So the producers in Champagne long ago came up with a method to remove that yeast. The bottles are slowly rotated and raised on end in a process called remuage or riddling. Over time, this moves the yeast to the neck of the bottle, next to the cap. Traditionally this was done by hand but most of the time is not done by machines. When the yeast is at the top of the bottle and the producer is ready to finish the process, the bottles undergo a process called dégorgement. Basically the neck of the bottle is frozen, capturing the yeast cells in a plug of frozen wine. The bottle is then briefly opened and the cap, complete with those little yeasties, is pushed out. The bottles are then quickly corked, usually after adding a small amount of sweet wine to top the bottle up (called the dosage), with a cage over the cork to hold it in. Thats it! Sounds complicated but it is an ancient process that has been used for hundreds of years. Sparkling wines vary depending on the style they are made in, the region they are from and the wine making technique. Some, like Moscato d'Asti or Champagne Demi-Secs are slightly sweet. However, most are relatively dry. The best have an invigorating acidity and those fizzy bubbles that make them lively and refreshing on the palate. Most sparkling wines are served cold in tall thin glasses called Champagne Flutes to accentuate the pretty bubbles. While they are the consummate toast, celebratory and apéritif wines, many bubbly wines are outstanding with a variety of foods. Working with everything from Sushi to spicy Indian food, these wines are actually quite versatile at table. Done with the Sparkling Wines page?